Whilst Hazel loves creating quirky, feisty characters for newly independent readers in her easy-to-read junior chapter books (such as Sleuth Astrid the mind-reading chook), she thrives on writing for all ages and has published over 200 books across a range of subjects and genres. Published titles include ‘ f2m:the boy within’, a co-written, young adult novel about gender transition, picture book Stickybeak and the Frequent Flyer Twins series. 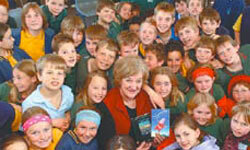 Hazel has collaborated with experts in various fields to publish adult non-fiction titles such as such as ‘ Difficult Personalities’, ‘Friends’, ‘Committeeitus’ and ‘Simply Events’ and helps people craft interesting stories about their ancestry in her popular workshop based on her book ‘ Writing a Non- Boring Family History”. 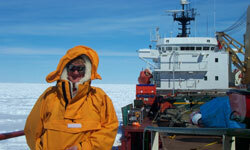 In 2001, Hazel was awarded the Australian Antarctic Division Arts Fellowshipand travelled to Casey Station on the ‘Polar Bird’ ice-ship. This visit inspired a range of creative projects including the young adult eco-thriller 'Antarctica's Frozen Chosen', picture book ‘ Antarctic Dad’and the memoir, ‘ Antarctic Writer on Ice’as well as classroom playscriptsand literacy material. 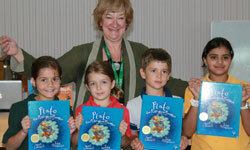 A fan of interesting and unusual locations, Hazel has been a guest writer in residence at the former Fremantle Prison (which is now the Fremantle Children's Literature Centre), the Mt Newman mining community in outback WA, a visiting author to Pasir Ridge International School in East Kalimantan, Indonesia and an author ambassador to Youfu West Street International School in Nanjing, China. Passionate about literacy and creativity, Hazel has mentored gifted children and proudly held the title of Reading Ambassdor for various organisations. Formerly a director on the Committee of Management of the Australian Society of Authors, Hazel was awarded an OAM for Literature in 2013. A keynote speaker, Hazel has been involved in web-chats internationally as a way of sharing books, ideas and encouraging literacy. She has even been a ‘Living Book’ online, to answer questions. Downloadable bio of Hazel for organisers under Media Resources. Married to Garnet, with two adult children , Hazel writes a new story for her two grandsons each birthday. Hazel enjoys swimming, bellydancing and reading in the bath. Though not simultaneously!